Anyway... after my mantle obsession, which was momentarily fixed by ordering a vase from West Elm, some dried florwers from Michael's, and a promise from Puff of buying something super cool in Scandinavia to fill in the center, I let it go. 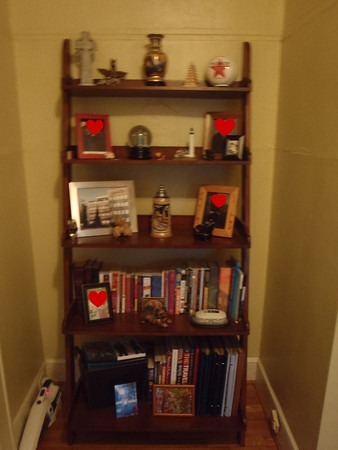 But my focus shifted to our bookshelf in the hallway instead. 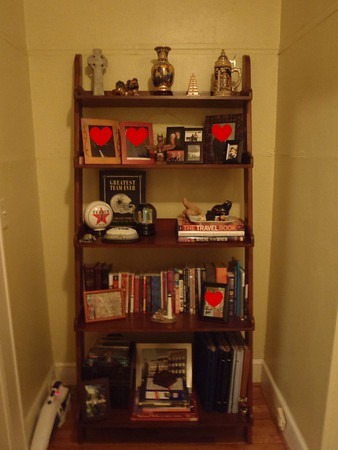 It had been very much a "bachelor" organized bookshelf, with just a few things of mine that I crammed on the shelf when I moved in. And after plopping down our very cool new rug from West Elm (that store is newly dangerous to my wallet) I thought it needed a makeover. And yes, I did stand there for a few minutes admiring my work... and nit-picking it as well. I'm still not 100% sure about the Cowboys book on the third shelf, but I felt like I needed some height on that shelf and it was what I had that worked best. So, for now, my "O" is satisifed with this project. I wonder what we'll latch on to next????? ?